Hillary Rodham Clinton and her husband made at least $30 million over the last 16 months, mainly from giving paid speeches to corporations, banks and other organizations, according to financial disclosure forms filed with federal elections officials on Friday. The sum, which makes Mrs. Clinton among the wealthiest of the 2016 presidential candidates, could create challenges for the former secretary of state as she tries to cast herself as a champion of everyday Americans in an era of income inequality. The $25 million in speaking fees since the beginning of last year continue a lucrative trend for the Clintons: They have now earned more than $125 million on the circuit since leaving the White House in 2001. The Clintons’ riches have already become a subject of political attacks, and her campaign has been eager to showcase Mrs. Clinton as a more down-to-earth figure. Her only declared Democratic opponent at this point, Senator Bernie Sanders of Vermont, is an avowed socialist, while Republicans like Senator Marco Rubio of Florida and Gov. Scott Walker of Wisconsin have considerably more modest means. A major dimension of Mrs. Clinton’s candidacy is expected to be policy proposals to narrow the gap between the rich and poor and to address stagnant wages. Yet she is far from those problems; while she said she and President Clinton were “dead broke” when they left the White House in early 2001, they are now part of the American elite. You knew you were running for President. You knew this would put a bullseye around you. Why, for the love of FSM, why? Let’s earn 25 mill real quick then pivot to speaking for the common man. No one will notice, amirite? Almost a decade ago, as Hillary Clinton ran for re-election to the Senate on her way to seeking the presidency for the first time, the New York Times reported on her unusually close relationship with Corning, Inc., an upstate glass titan. Clinton advanced the company’s interests, racking up a big assist by getting China to ease a trade barrier. And the firm’s mostly Republican executives opened up their wallets for her campaign. During Clinton’s tenure as Secretary of State, Corning lobbied the department on a variety of trade issues, including the Trans-Pacific Partnership. The company has donated between $100,000 and $250,000 to her family’s foundation. And, last July, when it was clear that Clinton would again seek the presidency in 2016, Corning coughed up a $225,500 honorarium for Clinton to speak. In the laundry-whirl of stories about Clinton buck-raking, it might be easy for that last part to get lost in the wash. But it’s the part that matters most. The $225,500 speaking fee didn’t go to help disease-stricken kids in an impoverished village on some long-forgotten patch of the planet. Nor did it go to a campaign account. It went to Hillary Clinton. Personally. 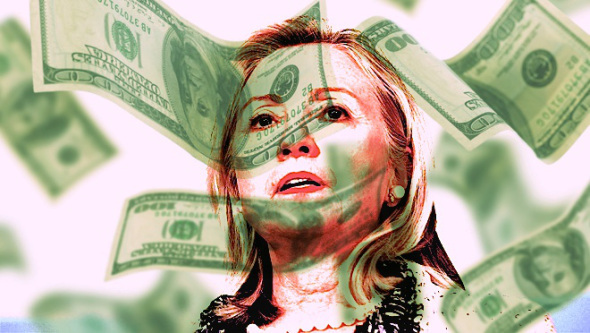 The latest episode in the Clinton money saga is different than the others because it involves the clear, direct personal enrichment of Hillary Clinton, presidential candidate, by people who have a lot of money at stake in the outcome of government decisions. Her federally required financial disclosure was released to media late Friday, a time government officials and political candidates have long reserved for dumping news they hope will have a short shelf life. Together, Hillary and Bill Clinton cleared $25 million on the lecture circuit over the last 16 months, according to a Hillary Clinton’s personal financial disclosure required of presidential candidates. A lot of the focus will naturally go toward the political argument that Clinton’s wealth makes her out of touch. The US has had plenty of good rich presidents and bad rich presidents. What’s more important is whether they are able to listen to all of the various interests without being unduly influenced by any of them. There’s a reason government officials can’t accept gifts: They tend to have a corrupting effect. True, Hillary Clinton wasn’t a government official at the time the money was given. But it is very, very, very hard to see six-figure speaking fees paid by longtime political boosters with interests before the government — to a woman who has been running for president since the last time she lost — as anything but a gift. By this point, most Clinton allies wish they had a button so they didn’t have to go to the trouble of rolling their eyes at each new Clinton money story. The knee-jerk eye-roll response to the latest disclosure will be that there’s nothing new to see here. But there’s something very important to see that is different than the past stories. This time, it’s about Hillary Clinton having her pockets lined by the very people who seek to influence her. Not in some metaphorical sense. She’s literally being paid by them. That storyline should be no less shocking for the fact that it is no longer surprising. The skimpy fig leaf of timing, that the speeches were paid for when she was between government gigs, would leave Adam blushing. And while most Democrats will shrug it off — or at least pretend to — it’s the kind of behavior voters should take into account when considering whether they want to give a candidate the unparalleled power of the presidency. It goes to the most important, hardest-to-predict characteristic in a president: judgment. For progressives, all this is, to put it mildly, depressing. Working to get someone with Hillary Clinton’s political views elected would require a certain amount of nose-holding even if she and her husband were above reproach, ethically speaking. Under the circumstances, a race between Clinton and, say, Scott Walker is going to be akin to trying to acquire a sprained ankle instead of a major heart attack.